This year has been one for the record books in Nebraska — at-least meteorologically . As the Omaha-World Herald reports, the period between September through February was the fifth-wettest fall-winter on record, this February the eighth-coldest on record. Thats not to mention that this recent deluge is responsible for Nebraska’s worst flooding in 50 years. This flooding is due to a bomb cyclone, the meterological equivalent of a bass drop. When a low pressure system drops at-least 24 millibars in 24 hours, it undergoes the rather terrifyingly named explosive cyclogenesis. This pressure drop makes the ensuing storm stronger and can even approach a category 1 hurricane in terms of wind and rain. As the waters recede, Its hard not to notice the how utterly un-drivable many of the roads underneath are. And it seems that this is not just the case of a single storm’s damage but indicative of a legacy of poor infrastructure management. Today, my mom @sheryluehling sent pictures of what used to be a county road we used often to get to Oakland when I was a kid. It’s give or take a mile away from my parents’ home, and the road no longer exists. I’ve spent the last few days worried about my hometown, family and community. It’s been hit by countless floods, hailstorms and and tornados the last 10 years, but this flood will undoubtably be the most gut wrenching of them all, and it’s heartbreaking not to be able to do anything about it. But I’m confident in knowing that Nebraskans live with the mentality that if you take care of your people, they will take care of you. #NebraskaStrong #NebraskaFlood2019 #Nebraska In the picture are my dad and sister. I understand Omaha is a big city and there was a lot of snow, but I'm confused about what the city's plan was. Where have they actually plowed so far? From what I've heard, the roads are still awful. Heck, OPS has already cancelled school for tomorrow. In the heightened national attention, perhaps pressure to fix the roads will finally lead to serious investment. As it seems, the current government is slow to admit fault and responsibility. BOSTON — The dust is still settling from the ongoing restructuring of the Middle East known as the Arab Spring. What started with the self-immolation of Tunisian street vendor Mohamed Bouazizi in 2011 has tapped a well of civil disobedience that has trickled throughout North Africa and the Middle East for nearly a decade. In Egypt, the protests led to the ouster of then President Hosni Mubarak. His nearly thirty year rule came to an end after eighteen days of sustained demonstrations, both in the streets and online. In the upheaval since, Mubarak’s successor and Egypt’s first democratically elected president, Mohamed Morsi, was replaced after a term of just a year, in a coup d’état led by the military general Abdel Fattah el-Sisi. While comprehensive death tolls have been difficult to tabulate; over eight-hundred civilians were killed and six-thousand injured in the eighteen days between the start of the protests and Mubarak’s ouster and conservative estimates place the death toll at over eight-hundred on just one day in 2013 during the Rabaa massacre by Egyptian security forces led by el-Sisi. The protestors, the people of Egypt at large, who have catalyzed the political upheaval in Egypt have also channelled their energies into alternative methods of civic engagement. Amin Marei, a native Egyptian and a current Teaching Fellow at Harvard and the Associate Director for Professional Education for the Harvard Graduate School of Education, actively participated in the the Arab Spring by co-founding Mashroo3 Kheir (The Good Deed Project). I interviewed him to get his perspective on the Arab Spring, and what has happened since its first peak. Wakanene Sebastian Kamau: What motivated you to participate in the Arab Spring? 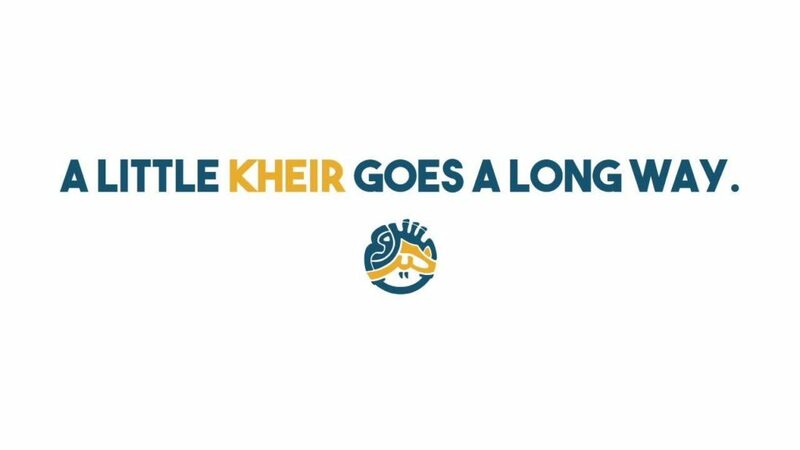 What was your thought process behind starting Mashroo3 Kheir? Amin Marei: For me, it was an opportunity to eradicate corruption in the country and to achieve social justice, freedom of expression and equity.The thought process behind Mashroo3 Kheir, which translates to (the Good Deed Project) was to capitalize on all the energy that was clearly present during the Arab Spring and try to channel it towards civic engagement and community development. The theory of action as, that if we provide the youth with opportunities to learn more about their communities and positively influence their society, then they can be actively engaged citizens who are able to tackle the challenges of their communities. M: To provide the youth with an opportunity to develop themselves while working with fellow citizens and learning from them. WSK: What were some of the successes/challenges in maintaining the growth of Mashroo3 Kheir? AM: The successes include supporting the development of hundreds of volunteers who have been the part of Mashroo3 Kheir many of whom have become active members in their own communities. I hope that another success is supporting fellow members of the community in a thoughtful way. The challenges include navigating our way through complex laws and regulations. They also include working with volunteers, which has an element of unpredictability that makes it hard to sustain the work. The other challenge is how to support other members within your community without being condescending or making them feel that you’re better than them. This is a real challenge in Egypt, and in the Middle East where classicism is a serious issue. WSK: How involved are you in post-peak Arab spring activism?AM: I’m involved in projects that I would like to believe are related to activism, not necessarily in the traditional sense. Through my work at Harvard, I support the learning of phenomenal educators all over the Middle East. I also do my best to be as supportive as I can be to any person who is interested to support others within his/her community. WSK: How involved you with activism in Egypt now that you are abroad? AM: Again it depends on the definition, I’m definitely less involved since I’ve been living abroad for some time, but I do my best to stay connected and to support anyone who asks for my support. You know when you have a bad idea, just awful, but you can’t resist implementing it? My apologies for this piece…at best, perhaps, it communicates the scale of the action. Sources below the fold. Early last Friday, a sunny morning, a truck fatally struck Tess Rothstein on Howard Street in San Francisco on her commute to work. A bystander who witnessed the event explained that as Rothstein rode along the parallel-parked cars along the strip, a door opens unexpectedly. As she dodges the car door, she swerved into the truck’s path. Within two hours, a group gathered in memoriam and in advocacy. Any city cyclist knows the dangers that come along with cycling when they feel the first multi-ton bus fly by and test their balance. But in San Francisco, crashes are prevalent and can be deadly. Howard Street alone, in the blocks without protected bike lanes, has claimed 8 lives. Outraged, San Francisco cyclists have formed advocacy groups. One of the most successful, People Protected, just two months before this crash celebrated a major win illustrated in newly opened protected bike lanes on Valencia and Howard Street. With the victory of that project, bike lanes started on 6th street. Rothstein was struck only two blocks before, on 4th. Protestors lined up a few feet from the parallel parked cars. With cars whizzing by, these advocates acted as human barriers between cyclists and the vehicles of the busy street. The group gathered 3 times throughout the day, with the support of local media and politicians. On 2 hours notice, a few hundred people assembled for a @PeopleProtected bike lane on Howard after today's terrible tragedy. Now it's your turn. Do better @sfmta_muni. Other advocacy groups such as Our Bikes further guided the way for cyclists and concerned political participants throughout San Francisco to act in dissent against anti-bike policies. An instagram post highlights a call to action. Tess Rothstein’s death yesterday on Howard was preventable. Too many people have been killed while riding a bike along the Howard corridor. Join us in demanding a protected bike lane on Howard from 6th Street to the Embarcadero immediately. Last year New York City installed more than 25 miles of protected bike lanes. This year they’re planning to install more than 30 miles. How many miles are you going to install this year? Had you completed the protected bike lane on Howard to Embarcadero—or at a minimum, 4th Street—Tess Rothstein would be alive today. We need to be proactive in the installation of protected bike lane infrastructure to reach our Vision Zero target of zero fatalities by 2024. Finish the protected bike lane on Howard by the end of March. Tess Rothstein was killed this week after a driver opened their door into her path, forcing her under a truck which ran her over. A protected bike lane on Howard would have saved her life. We need the SFMTA to be proactive and install protected bike lanes on every stretch of the high injury network by the end of this year. Other cities have taken swift action and expanding their protected bike lane networks rapidly. Why does the SFMTA under Ed Reiskin’s leadership only install protected bike lanes after someone is killed? That is not leadership. Extend the protected bike lane on Howard to 3th Street within the next 21 days and to the Embarcadero by the end of 2019. These deaths cannot continue in our city. The tragedy today on Howard Street is heartbreaking and my thoughts are with the victim’s family and friends. This is yet another example of why our streets need to be made safer for all users. The city sees this is a problem, and each group has expressed commitment to action. Citizens were in peaceful protest, politicians promised to make political changes, and in the spirit of SF and Silicon Valley, techie cyclists advertised their cyclist apps. Applications like Blocked show where bike lanes are currently blocked by construction in the city. 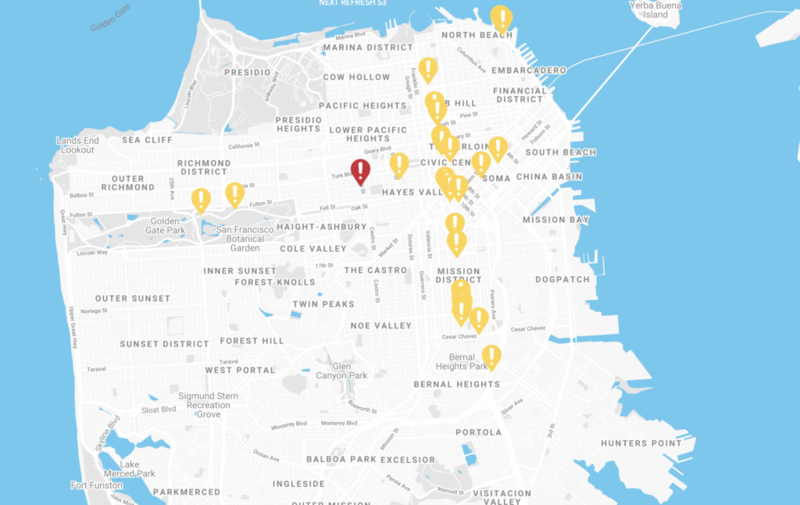 Some visualizations show the most dangerous and at-risk crash sites of the city. Others like Bikesy simply route a rider on a bike-safe route to their destination in an attempt to promote ease and safety of bike travel. And throughout most of these advocacy group sites, there are seemingly endless tools, workshops, maps, among other resources and projects to help the average cyclist. Although this issue affects SF particularly hard, many cities are grappling with the same issues. Coalitions of safe-biking advocates have formed throughout the US, including D.C., New Orleans, Cambridge, Hawaii, and Philadelphia, as well as National Lobby Groups with local chapters. Personally, the initial fear instilled in me by the first bus that passed too closely has been enough to end my bike-to-work days. But so many of my friends have been “tapped” by cars, and a few seriously hit. One told of a time just outside our space at the Media Lab where he was hit at the intersection. He fell off his bike, his wheel was completely bent, the driver of the car was flustered, fearful, and angry, and all he could think about was that he could have died. Stories like my friends are frightening, and stories like Tess’s are tragedies. However, I feel hopeful and inspired by the response of those in San Francisco, and hope the outcry of protests and groups like these ensure that safety measures are put in this city and many others across the US and beyond to protect people like Tess. Lion Air Flight 610 crashed on October 29, 2018. All 189 passengers and crew died. Ethiopian Airlines Flight 302 crashed on March 10, 2019. All 157 passengers and crew died. Airport people, kind, promoted me to the next flight that would leave at 11:20, they apologized for the inconvenience and transferred me to a nice lounge for the-waiting. On 10:50, as we joined the next flight, two security officers informed me that for security reasons that a senior officer will explain to me, they will not allow my boarding. In my intense protests they left no margin of discussion and led me to their superior, to the airport police department. He told me gently not to protest and say thank you to God, because I am the only passenger who did not enter the flight et 302 which is missing. And that this was why they can’t let me go, until I determine who I am, because I didn’t get on the flight and everything. At First I thought he was lying, but his style left no margin of doubt. I felt the ground lost under my feet, but I came back in 1-2 seconds because I thought something else would happen, some communication problem maybe. People were kind, they asked that they had to ask, they my elements and let me wait. They made me sit in a living room and they told me to wait there until they warn me. I was looking on the internet to find elements for the flight, friends from Nairobi informed me that 30 minutes after the expected time had not landed and there was no information about her luck and suddenly all the wifi of the airport. Fortunately there are sms – from close friend I learned that the flight crashed almost just took off and that the issue was going out in the Greek media. Then I realized that I must immediately contact my own people and tell them that I was not in and that for two small random circumstances I lost the flight – the moment I made that thought i collapsed because then exactly I realized how lucky I stood. This text I wrote to manage my shock. I’m posting it because I want to tell everyone that the invisible and, nēmatídia of fortune, the out-of-plan circumstances knit the web in which our life is taken. It’s millions of small threads we almost never feel – but one to break is enough to feed the whole web instantly. Really, it’s the first time I’m so glad I wrote a post and I’m grateful to live and that I have so many friends that made me feel their love – kisses to all and a warm thank you for your touching support. Special citation reference for early surgery and support to Jeroen Par Dijk Panos Fragiadakis Haris Kamariotakis and a big sorry to my family for the shock you’ve been looking for. Both planes were Boeing’s 737 MAX 8, which flew its first commercial flight between Kuala Lumpur and Singapore on May 22, 2017. Boeing was optimistic about its new plane even after the Lion Air crash. Two brand new Boeing 737 Max 8 airplanes flown by #EthiopianAirlines and #LionAir crashed in 5 months. Now, China has grounded all 96 of its 737 Max 8s. When government has been slow to react, customers and travel agents are taking matters into their own hands. Why no, I’m not at all nervous to get on Flight 460 that’s been delayed since 5:30 pm and is a Boeing 737. Why do you ask? Here’s NYTimes’ flight map of existing routes flown by the 737 Max 8. In the “iconic” MTV hit series, the characters and their love lives were as riveting as their drama and fashion choices. To properly gear up for the revival, I created this collection, curated with text, video and social. For the fans—may this excite you. For the novice—may this do some…errr…educating. For the first time in history, Dublin Jerome HS made it to the Ohio high school ice hockey final four, beating neighboring Olentangy Liberty HS 1-0 for their spot to represent Central Ohio. Dublin Jerome earns their spot in the final four. #LRT: With Dublin Jerome's 1-0 over Olentangy Liberty, the Celtics are in the Final Four for the #OHSAA Ice Hockey playoffs. In the state semifinal game, they played University School, a private school in Cleveland that had won the state championship twice, most recently in 2009. After 1 period Dublin Jerome with a 1-0 lead over University School in first OHSAA hockey semi-final. Nice pass from Trent Belli in the crease to a crashing Joel Kunzelman. #dublinjerome #celts #ohsaa Dublin beat this same team 8-2 earlier this season. After 2 periods: University School 2, Dublin Jerome 2. The close game eventually went to overtime. Dublin Jerome beats University School 3-2 in OT of the 1st State Hockey semifinal. The Wildcats will play the winner tomorrow at 11am. Finally! Dublin Jerome becomes the first ever Central Ohio school to reach the @OHSAASports state hockey championship game. As the first Central Ohio school to make the ice hockey state championship game, the team had already accomplished a lot. Joey Trobenter with the power play goal for St. Ignatius at 8:07 of the 1st. The Jerome team made it close, but eventually came up short. That is four straight state titles for St. Ignatius. Despite the loss, the Jerome team has lots to be proud of, and the fourth consecutive championship for St. Ignatius raises questions about fair competition among Ohio high schools. After the fact, local news picked up the story. In the wake of the 2016 presidential election, US media has focused much of its scrutiny on the Trump Administration’s possible ties to the Russian government. Although mainstream media coverage of possible ties between the Trump Administration and the PRC has been sparse, China experts have paid close attention to official and unofficial signs of the dynamics of emerging US-China relations. When would Xi visit the United States, and where was the follow up to the New York Times revelations about deals between Trump’s son-in-law, Jared Kushner, and China’s Anbang Insurance Corporation? Reporters tracked foreign investment by Chinese corporations. On March 2, a rumor surfaced on Twitter via a Chinese businessman visiting Mar-a-Lago. On March 13, the news broke that Xi would be visiting Mar-a-Lago. But, wait, what’s happening to the data on Anbang’s website? 1. As we reported, 35 of 39 Anbang shareholders, controlling 92% of the company, can trace all or part of their ownership to three people..
2. Those three people are Wu Xiaohui, his (ex?) wife Zhuo Ran (Deng's granddaughter) and Chen Xiaolu, son of Marshal Chen Yi. 3. Those three people are no longer shareholders according to the AIC records, though some of Wu's relatives are. Spicer says a question about the Anbang deal should go "to the Kushner Companies." What will develop next? Think this story’s over? Don’t believe a tweet of it…..
… and some even thought that weather reports smelt like fake news. … as were several of his detractors. It's a #snowday! Can't protest, but you CAN join the #IdesofTrump! Cut postcards from file folders, write stuff, &mail it to Trump tomorrow! Twitter has always been one of the more politically conscious social networks. But in the age of the Trump administration, politics seems to pervade even the most seemingly neutral subjects. It seems that politics is never far from tweeters’ minds – whatever the weather. What began as a 15,000-person protest against oppression and inequality in New York in 1908 is now a global event, with thousands of people from around the world marching, walking out, and demonstrate for women’s rights. On March 8th, women and men in small towns and large cities participated in International Women’s Day. Despite the shared goal among the protestors, each community celebrated the event in its own way. Below are snapshots of how International Women’s Day was celebrated, discussed, and, in some cases, questioned. Typically, there is not much protesting or marching in Japan, as people tend to avoid engaging in public discourse about politics or issues about women, especially in public spaces. But at 2:30 PM on March 8th in Tokyo, marchers took to the street. The event was organized bythe Women’s March Tokyo Organizing Committee and took place between Aoyama and Shibuya in the center of Tokyo. Though the 300 people who participated did not match the thousands who marched in New York, Dublin, or other large cities, the protesters were passionate and drew attention of the press.